New data released by Startup Direct to coincide with International Women’s Day on 8th March 2015, shows that the number of women over the age of 30 seeking start up finance and mentoring increased by a third in 2014. In 2013 women over the age of 30 made up just 25% of enquiries to the Government start up loan provider, but this grew to 57% in 2014, an increase of one third (32%). This trend is being driven largely by ‘Returners’; women who have taken a break from the workplace to have a family and are motivated to start their own business by the challenges of finding flexible and stable employment which is well paid enough to cover the cost of childcare. They are starting predominantly internet-based micro-businesses, employing fewer than 5 employees, which they can run part-time from their homes and are undeterred by the challenge of juggling home and family commitments with the demands of a new business. Naomi West, 32, worked in digital marketing for a Financial Services company before her first son, Jacob, now almost 3, was born. She no longer wanted to be on conference calls at 6am with her colleagues in Australia and Skype meetings at 9pm with her American team. She freelanced for a while but still found it difficult to juggle family life with deadlines and client commitments. 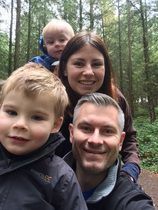 The peaks and troughs of work made planning childcare difficult and when her second son, Benjamin, was born with a heart defect, Naomi knew she needed to find a new way of working that would enable her to be there for her family. Having enrolled both her children in Baby Sensory classes, Naomi waited for an epiphany about her future career. It came when her Baby Sensory class leader told her she was recruiting for a new class leader and Naomi got the job, gaining valuable experience. When the opportunity to take on her own franchise arose she jumped at the chance, borrowing £15,000 in two loans from Startup Direct and launching her first classes in January this year. She now runs 11 classes per week, with up to 20 babies in each class. Startup Direct is encouraging more women to follow their dream of launching their own business by running a series of drop in sessions starting on 19th March aimed specifically at women.In particular this session is targeting ‘Returners’, those who want to start businesses following a period of maternity leave or a career break after having children.